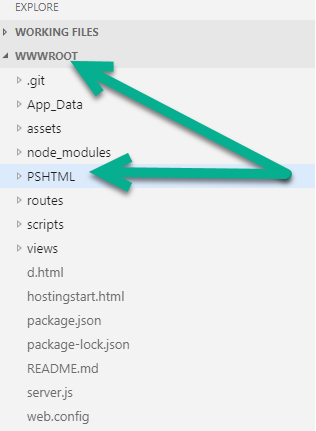 Here – PSHTML is our module to write HTML in PowerShell way! Now, that I cleared the ground let us move on to the demo. Link -href "https://stackpath.bootstrapcdn.com/bootstrap/4.2.1/css/bootstrap.min.css" -rel "stylesheet" -Integrity "sha384-GJzZqFGwb1QTTN6wy59ffF1BuGJpLSa9DkKMp0DgiMDm4iYMj70gZWKYbI706tWS" -CrossOrigin "anonymous"
script -src "https://stackpath.bootstrapcdn.com/bootstrap/4.2.1/js/bootstrap.min.js" -integrity "sha384-B0UglyR+jN6CkvvICOB2joaf5I4l3gm9GU6Hc1og6Ls7i6U/mkkaduKaBhlAXv9k" -crossorigin "anonymous"
script -src "https://stackpath.bootstrapcdn.com/bootstrap/4.2.1/js/bootstrap.bundle.min.js" -integrity "sha384-zDnhMsjVZfS3hiP7oCBRmfjkQC4fzxVxFhBx8Hkz2aZX8gEvA/jsP3eXRCvzTofP" -crossorigin "anonymous"
h1 -Class "display1" -Content "PSHTML Demo"
p -Content "PSTHML &hearts; PowerShell &hearts; Azure Web App!" Do you have questions like why not azure web jobs? why not pug? what not direct html? Feel free to connect with me and I am open to answer all your queries. ⟵PowerShell PSHTML now support charts – Work in progress!